No one can know which events are “epic” as they’re happening—that knowledge comes with time and perspective. Open a newspaper from the past 150 years, or the web today, and you’ll find endless events: birth and death notices, election results, disasters, advertisements to buy and sell everything. 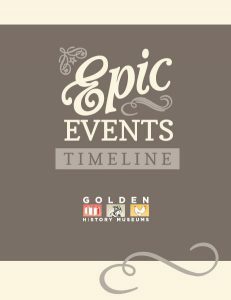 While the Epic Events exhibit showcases over three dozen events, it only scratches the surface. Use this timeline to peruse hundreds more from the past century and a half. Every first and third Wednesday in the History Lab you can drop in for assistance with research projects and questions. 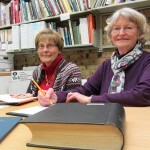 Collection volunteers will be in the gallery from 1-3 pm to direct and guide you using museum-clipping files, online resources like the Colorado Historic Newspaper Collection, and access to dozens of books, yearbooks, and directories from the museum’s reference collection. Stop by and say hi. The Golden branch of the Jefferson County Public Library donated their local history collection to GHM&P in 2015. The gift included 180 rolls of microfilm and almost 150 years of the Transcript. Responding to public demand, the museum quickly committed to making the resource publicly available by digitizing the collection and making them fully accessible and free online. Since obtaining the collection, the museum forged a partnership with both the Jefferson County Archives and the Colorado State Library to work with the existing Colorado Historic Newspaper Collection. The Jefferson County Archives has generously pledged to help fund this digitization project and see it through to completion. Digital copies of the following Colorado Transcript issues are now live: December 1866 through October 1965. Look for yourself. 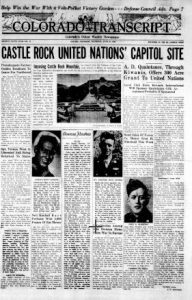 For the first time anyone can easily jump in and explore the Depression and World War II eras in Jefferson County and Golden. We offer the following links (in no particular order) to help you find the right local, county and state resources for your own needs. We use these same websites for our own research, and we know there’s always something new to discover.